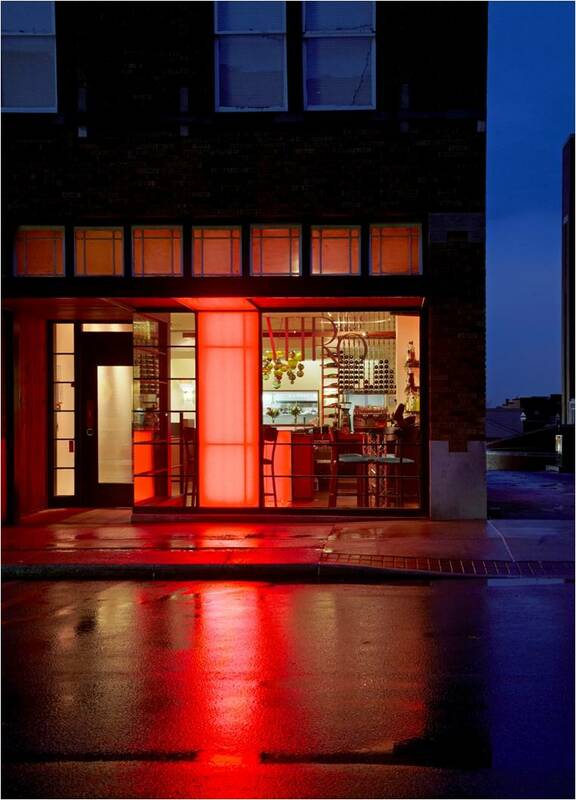 Located east of the historic Downtown Fayetteville Square, Vetro 1925 respects the historic nature of its cask while utilizing Italian precedents to create a new modern restaurant. The design explores this contrast through old versus new, light versus dark, and wood versus glass. An Italian-inspired glass storefront system modernizes the original building façade. The new storefront takes cues from the folding glass façade of the Florence train station. A minimal steel and glass structure opens the facade up invitingly on street level, leaving the existing craftsman-style clerestory windows intact. Inside the restaurant, the contrast between old and new, light and dark, wood and glass becomes clear. The older, original building elements, such as the exposed brick walls and refinished floors, take on darker tones. At the transition from the bar to the dining area, the oak floor rises up to encase a steel wine rack and create a threshold between spaces. In contrast, the newer elements such as the white-painted sheet rock walls and ceiling, the clear finished white oak millwork, and the glass ribbon take on lighter tones. The highlight of the design is the illuminated glass ribbon that creates the bar counter and continuously folds its way up and down to the entryway and out the front canopy.